Born in the bayous of Louisiana, handmade in Houston, Texas. This thing is a monster! Huge bass is the name of the game here. If you get a bite on this one HOLD ON! 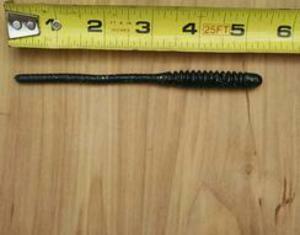 The worm is 12 inches curled and nearly 16 inches straight. What else needs to be said? look at the 8lb 4oz bass caught on this exact bait. 100% Bass Crack designed worm. Extremely versatile & DEADLY. Made from hand carved molds. Classic earthworm/trick worm. This worm is a killer. Can not go wrong here! Standard issue bass kickin gear! This bait is just awesome. Chunk it weightless, let it sink or jerk it like a top water. Excellent for fresh and saltwater. Excellent all around bass lure works great on any rig. Just chunk it! "WOW" is what i said the first time I fished this bait. Bites when nothing else works, plain and simple. Deadly mini stick bait. Try it with any rig. AKA,"The Contingency Plan". BEST tough bite bait in my arsenal. Jointed hook slot jerk bait. What can i say this bait... flat out catches bass! Every tackle box needs a bag! Round body lizard. I love this lure! Wicked craw with one of a kind action. 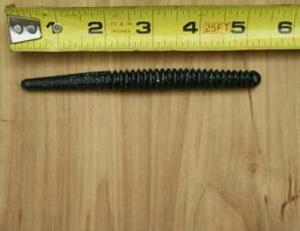 Fish this one peg weighted or Texas rigged. 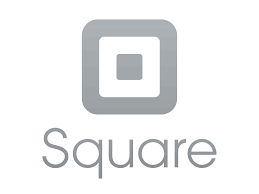 Very versatile bait. Works great Texas rigged or just weightless swimming. 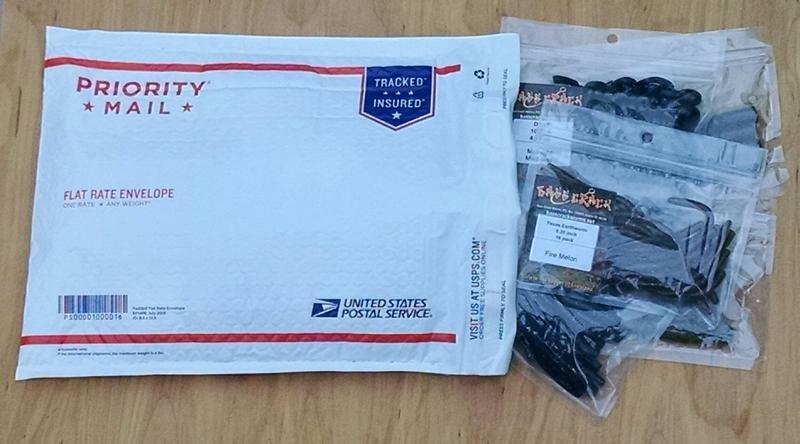 Up to 15 packs for a flat $7.25 Fast USPS Priority mail with tracking. 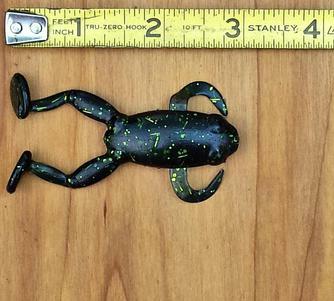 4.5" floating frogs float on a 3/0 wide gap worm hook. 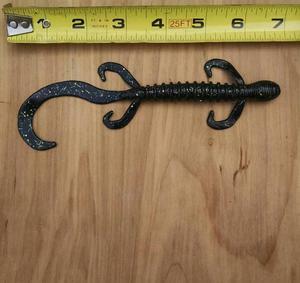 Monster hook slotted swim bait. Slow roll is the name of the game here! Super bite lure. Might not get a bite every time, but when you do... HOLD ON! Contact us if there is a color or bait you do not see, and would like to have made. Want the ultimate swim over grass bait? Look no further. Super Ring Dzard, is our first choice. 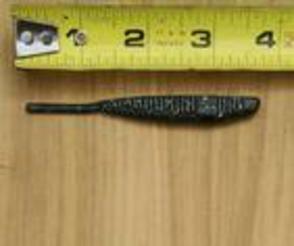 Uses bigger worm hooks 3/0-6/0. Stretched out bait is 8 inches. Awesome bait! WOW this worm is the new go-to worm. We have caught tons of bass on this worm. Get a pack and reel em in! A new take on the classic stick bait. Be different and catch bass doing it! Looking for that perfect tough bite bait? Well this little minnow fits the bill perfectly. Awesome, weightless around cover. 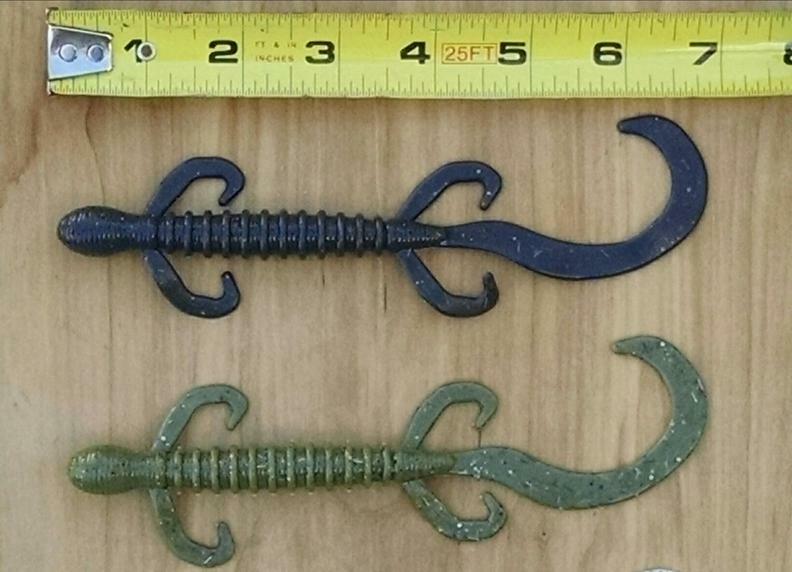 Lizards float on a 3/0 wide gap worm hook. 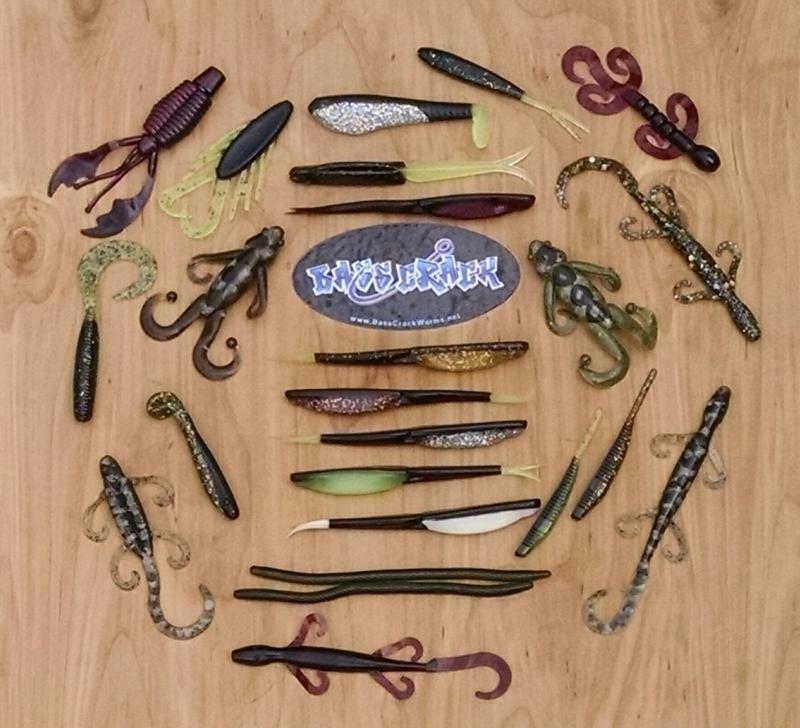 All baits pictured in Midnight Madness color, except floating baits. 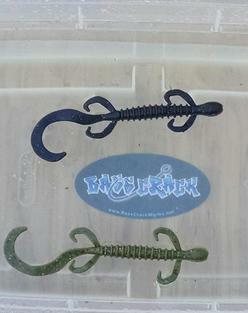 3" Twitch Frogs Float on a 1/0 wide gap worm hook.